"My hand trembles, my heart does not." The mission of the Stephen Hopkins Center for Civil Rights is to protect the rights that Americans recognize as fundamental. 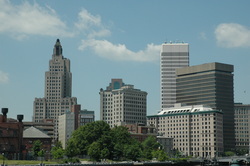 The center litigates in such areas as fiscal responsibility and transparency, school choice, free speech, and property rights to assist individuals the government has harmed, and ensure all Rhode Islanders enjoy their constitutional rights. The Stephen Hopkins Center for Civil Rights recognizes that a lack of personal resources to fund legal action often deprives citizens of their ability to challenge unconstitutional laws, unlawful regulations, and out of control bureaucrats. When it comes to defending themselves against overreaching government, too many citizens are indigent. Therefore, the Center has, as one of its primary purposes, the goal of representing the indigent to enforce their constitutional rights to free speech, property and economic liberty. Who was Stephen Hopkins and why is the Center named after him? During the colonial period leading up to, and including, the American Revolution, Stephen Hopkins was a leading advocate for liberty and independence. A native Rhode Islander, Hopkins served in a number of prominent public and private roles including, as a merchant, the first chancellor of Brown University, Chief Justice of the Rhode Island Supreme Court, Speaker of the Rhode Island General Assembly, Governor, and as a Delegate to the Colonial Congress in Albany in 1754 and to the Continental Congress from 1774 to 1776. Ailing from old age (and according to some historians, a degenerative neurological disorder) he famously signed the Declaration of Independence while declaring “my hand trembles, my heart does not.” Here at the Center, we work every day with the unwavering dedication to the cause of liberty exemplified by Governor Hopkins. Help Fund The Stephen Hopkins Center For Civil Rights Today! If you believe your constitutional rights have been violated by the government please read here to learn more about how the Stephen Hopkins Center can defend your rights. Our clients receive free legal representation thanks to the generosity of our donors. If you would like to make a donation or volunteer pro bono legal services to the Stephen Hopkins Center for Civil Rights please contact info@hopkinsri.org. If you are currently a law student you may be interested in a clerkship or externship at the Stephen Hopkins Center for Civil Rights. Please Apply.